I’m on Facebook a lot. My own personal page more than anything. For me, it’s a sort of personal scrapbook, a way to extract all those pictures and save them somewhere other than my iPhone. It also allows me to see what others are sharing and feel connected to people I sometimes never see! So I was on Facebook the other day and saw a post from a family friend talking about the passing of her daughter, Dr. Elizabeth M. Thybulle, whose son attends the same school as my son, Eastside Catholic. Matisse Thybulle is a star basketball player, ranked 338th nationally and sixth here in the state. He was just signed to play with the Huskies. The more I dug into this story, the more poignant and amazing it was. It’s a story, really, about the strength of a family. And the bond with our children. We all expect to see our children through school, see them get married, be there for their most important moments. You don’t expect to die from leukemia at 50 after being given a great prognosis, just because of an adverse reaction to the chemo. 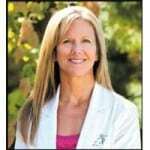 And this was a woman who was a celebrated naturopathic doctor in Bellevue, a triathlon competitor, runner and biker. She passed away unexpectedly on Monday, but her son played on parent’s night at Eastside Catholic on Tues and scored 17 points, many of them with a smile on his face. Brings tears to my eyes just thinking about it. Bless you, Elizabeth. You live on in your children.